Long the material for jokes, snoring is generally accepted as common and annoying in adults but as nothing to worry about. 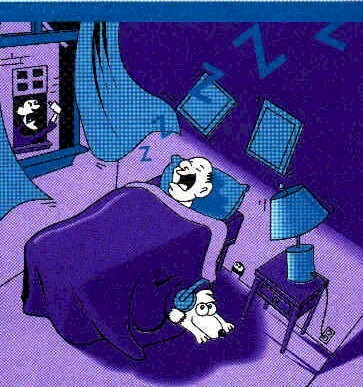 However, snoring is no laughing matter. Frequent, loud snoring is often a sign of sleep apnea and may increase your risk of developing cardiovascular disease and diabetes, as well as lead to daytime sleepiness and impaired performance. Snoring is caused by a narrowing or partial blockage of your airways at the back of the mouth and upper throat. This obstruction results in increased air turbulence when breathing in, causing the soft tissues in your throat to vibrate. The end result is a noisy snore that can disrupt the sleep of your bed partner. This narrowing of the airways is typically caused by the soft palate, tongue, and throat relaxing while you sleep, but allergies or sinus problems can also contribute to a narrowing of the airways, as can being overweight and having extra soft tissue around your upper airways. Not everyone who snores has sleep apnea, but people who have sleep apnea typically do snore loudly and frequently. Sleep apnea is a serious sleep disorder, and its hallmark is loud, frequent snoring linked to intermittent brief pauses in breathing while sleeping. Even if you don’t experience these breathing pauses, snoring can still be a problem for you as well as for your bed partner. The increased breathing effort associated with snoring can impair your sleep quality and lead to many of the same health consequences as sleep apnea. One study found that older adults who did not have sleep apnea, but who snored 6–7 nights a week, were more than twice as likely to report being excessively sleepy during the day than those who never snored. The more people snored, the more daytime fatigue they reported. That sleepiness may help explain why snorers are more likely to be in car crashes than people who do not snore. Loud snoring can also disrupt the sleep of bed partners and strain marital relations, especially if snoring causes the spouses to sleep in separate bedrooms. Snoring also increases the risk of developing diabetes and heart disease. One study found that women who snored regularly were twice as likely as those who did not snore to develop diabetes, even if they were not overweight—another risk factor for diabetes. Other studies suggest persistent snoring may raise the lifetime risk of developing high blood pressure, heart failure, and stroke. About one-third of all pregnant women begin snoring for the first time during their second trimester. If you are snoring while pregnant, let your doctor know. Snoring in pregnancy can be associated with high blood pressure and can have a negative effect on your baby’s growth and development. Your doctor will routinely keep a close eye on your blood pressure throughout your pregnancy and can let you know if any additional evaluations for the snoring might be useful. In most cases, the snoring and any related high blood pressure will subside shortly after delivery. Snoring can also be a problem in children. As many as 10–15 percent of young children, who typically have enlarged adenoids and tonsils, snore on a regular basis. Several studies show that children who snore (with or without sleep apnea) are more likely than those who do not snore to score lower on tests that measure intelligence, memory, and ability to maintain attention. These children also have more problematic behavior, including hyperactivity. The end result is that children who snore do not perform in school as well as those who do not snore. Strikingly, snoring was linked to a greater drop in IQ than that seen in children who had elevated levels of lead in their blood. Although the behavior of children improves after they stop snoring, studies suggest they may continue to get poorer grades in school, perhaps because of lasting effects on the brain linked to the snoring. You should have your child evaluated by your doctor if the child snores loudly and frequently—three to four times a week— especially if brief pauses in breathing while asleep are noted and if there are signs of hyperactivity or daytime sleepiness, inadequate school achievement, or slower than expected development. Snoring in older children and adults may be relieved by less invasive measures, however. These measures include losing weight, refraining from tobacco, sleeping on the side rather than on the back, or elevating the head while sleeping. Treating chronic congestion and refraining from alcohol or sedatives before sleeping can also stop snoring. In some adults, snoring can be relieved by dental appliances that re-position the soft tissues in the mouth. Although numerous over-the-counter nasal strips and sprays claim to relieve snoring, no scientific evidence supports those claims.